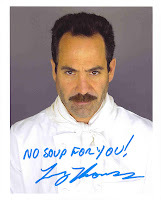 One of the most memorable characters from Jerry Seinfeld’s sit-com was the infamous Soup Nazi, who sold the best soup in New York, but whose clearly posted ordering rules were so strict, that if you did not precisely abide by them, there would be “no soup for you!” even though you could well have been waiting in line for over two hours. Portrayed so well on the small screen by actor Larry Thomas, that he was nominated for a 1996 Emmy for the role, the character was based on Al Yeganeh, an actual New York restauranteur. The long lines and his short fuse, at his midtown Manhattan “Soup Kitchen International,” located at 259A West 55th Street, near 8th Avenue, have made him an area institution. The place would close during the summer, with a sign posted outside that simply said that the chef was in "Argentina for the summer." The original location is now closed and Mr. Yeganeh has a 1,000 store franchise is in the works. This is the soup that Jerry orders in the show and it’s the most requested Soup Nazi recipe. 2. Put half of the shells into a large pot with 4 quarts of water over high heat. Add the onion, 1 stalk of chopped celery, and the garlic, then bring the mixture to a boil. Continue to boil for 1 hour, stirring occasionally (The white part of the shells will start to become transparent), then strain the stock. Discard the shells, onion, celery and garlic, keeping only the stock. 4. Add the potatoes and bring the mixture to a boil, then add 1/2 of the crab and the remaining ingredients to the pot and bring it back to boiling. Reduce the heat and simmer uncovered for 4 hours, until it reduces by about half and starts to thicken. Add the remaining crab and simmer for another hour until the soup is very thick. 1. Preheat your oven to 375 degrees. Bake the sweet potatoes for 45 minutes or until they are soft. Cool the potatoes until they can be handled. 2. Peel away the skin, then put the potatoes into a large bowl. Mash for 15-20 seconds, but don't mash them until they are entirely smooth. 3. Spoon the mashed sweet potatoes into a large saucepan over medium/high heat, add the remaining ingredients, and stir to combine. 4. When the soup begins to boil, reduce the heat and simmer for 50-60 minutes. The cashews should be soft. Serve hot and garnish with more cashews, more half and half or sour cream and chives, cilantro, or parsley. Now, move to the EXTREME left!